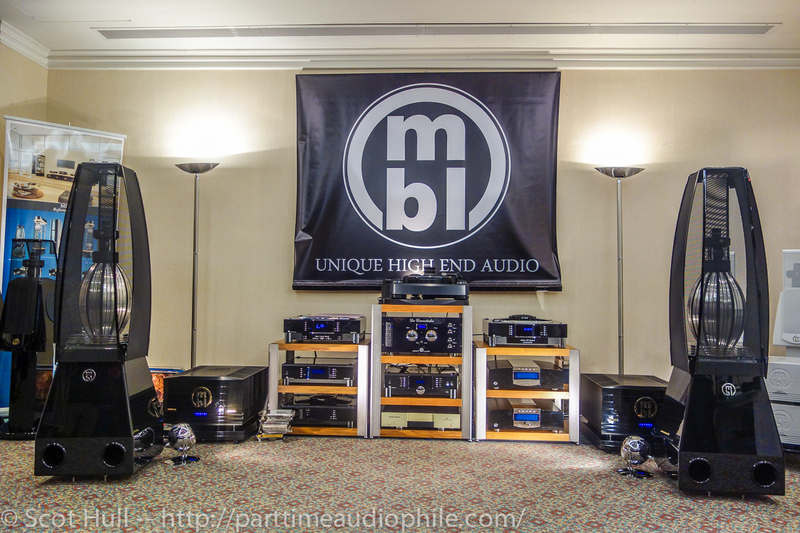 The 2014 Sound and Vision show held in Athens has come to an end. 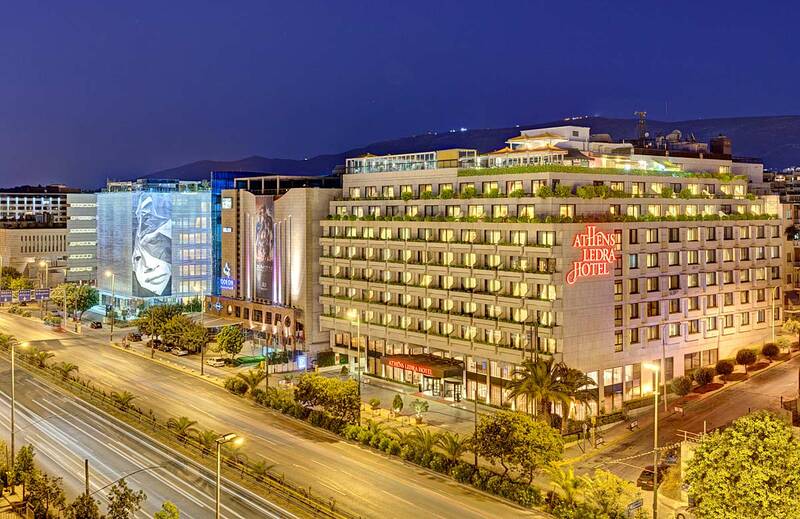 A biggy this year, more than 65 rooms and halls with just two days’ time to listen, explore, and digest lots of amplifiers, speakers and DACs. Two days are not enough, one has to do some homework and decide what to listen to and what to leave aside. The organizers have communicated an incredible 4.500 visitors; incredible seems the right word to describe it. Shows also help to sense the pulse of the market, understand what trends will be followed in the upcoming years. I know, you are thinking of headphones, DACs with high-resolution music and vinyl, let me talk to you about another one: Class D amplifiers. While not as discussed as the major trends, I have no doubt we will be seeing more and more amplifiers built around the various Class D modules from Hypex, Bang&Olufsen, Pascal or proprietary designs. Devialet is a great reality; MBL produces the Corona line while new players like Mola-Mola and Merill complete an entire “cool running” universe. What got me reflecting was the choice of an important audio group like Dantax, owner of Raidho, Ansuz, Scansonic and now Aavik, to launch a $30.000 integrated amplifier with switching technology. Similar modules can be found on the Gato Audio amplifiers, same goes for Jeff Rowland’s Continuum S2 integrated. Remains to be seen if the Class D amplifiers can conquer the hearts of audiophiles because up to now it was mostly about offering hundreds of watts at relatively affordable prices. At the end of each show I find myself thinking of what was worth the time or the money, which rooms presented the best possible sound for a show, which offered something more than just a pile of electronics on a rack with price tags printed in small signs. I count several rooms that stood up, most of which you have read about in these pages, and candidate as best sound of the show. Raidho’s D3 with the new Aavik U-300 integrated amplifier had air, timbral accuracy, and a sense of ease during playback that I am so much fond of. The Tidal speakers share some of the same characteristics and the Select DAC by MSB is on a class of its own; the combined result was overwhelming with the soundstage going from wall to wall and from floor to ceiling. The MBL system always delivers if soundstage is your thing; nothing comes even close to this sensation of full immersion the Radialstrahlers provide. 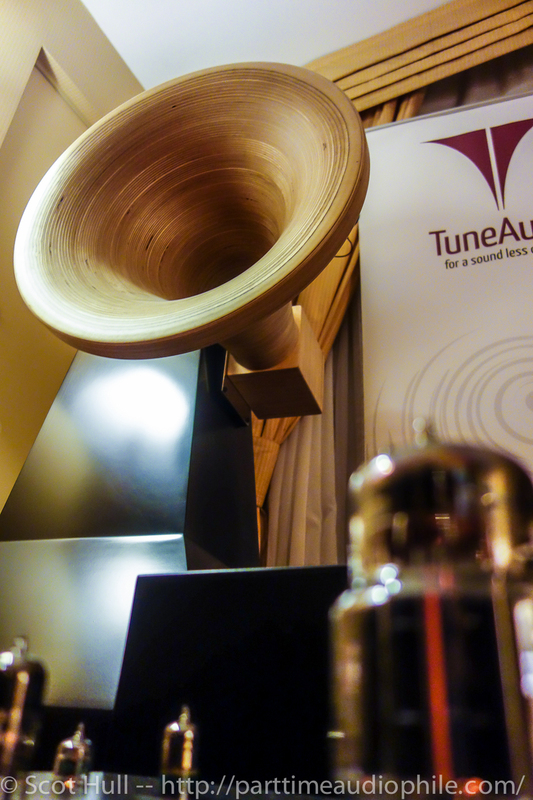 Then there was the Tune Audio Anima horns who never stop to amaze me with their clarity, speed and wide frequency extension. Very few horn speakers vaunt 109dB of sensitivity without following the easy path of class D assisted woofers and none that I am aware off pulls a trick like a first order cross-over in all three ways that results in such a seamless blending among drivers. After finishing the show report I went back to what I wrote, my notes and pictures, trying to pick the best. I might let down some people but I have not come up with a “best” so no best sound of the show this year. 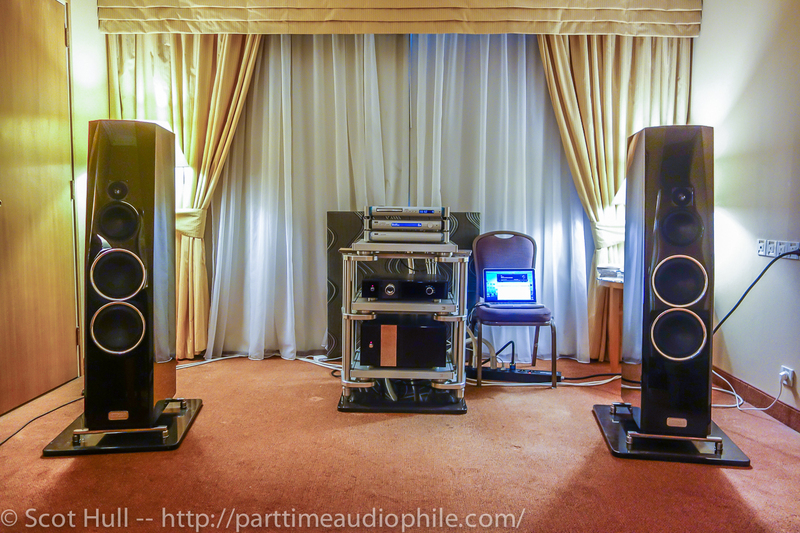 I would have given the Audio Traveler’s “Best of Show” prize to Tune Audio hands down if it wasn’t for the room itself, too small to let that massive 15” horn loaded woofer to be expressed freely. That system, with Lamm’s electronics, on certain passages performed stunningly but when the program was bass heavy the room simply could not handle the pressure, something that is easily predictable judging by the sheer size of those horns. Something similar happened with the Tidal system, the speakers suffocated in the smallish room and while I knew there was a huge potential it never convinced me that the system was performing at 100% of the great possibilities it has. Raidho on the other hand had the magnificent D-3 speakers on a hall the size of a football field and half again; yet here too I felt like I was only tasting the potential. Are you familiar with those gourmet restaurants that bring the fanciest of the menus but portions are so small that flavors don’t even make it all the way down your esophagus? That was the Raidho room, gourmet taste, but not enough. MBL was a case apart. The Radialstrahlers perform amazingly, but for some reason it is not my cup of tea. This full immersion they provide can be highly impressive at first but results almost unnatural, maybe I have not had enough time with them. Chances are I will never have enough time to get used to this experience with their price tag and even if I could afford them, I should build another auditioning room as these need so much more space than every other system in order to perform to their maximum. Could all this be different? Sure, put the Animas at the hall were the Raidhos were or provide double the space for the Tidal system. 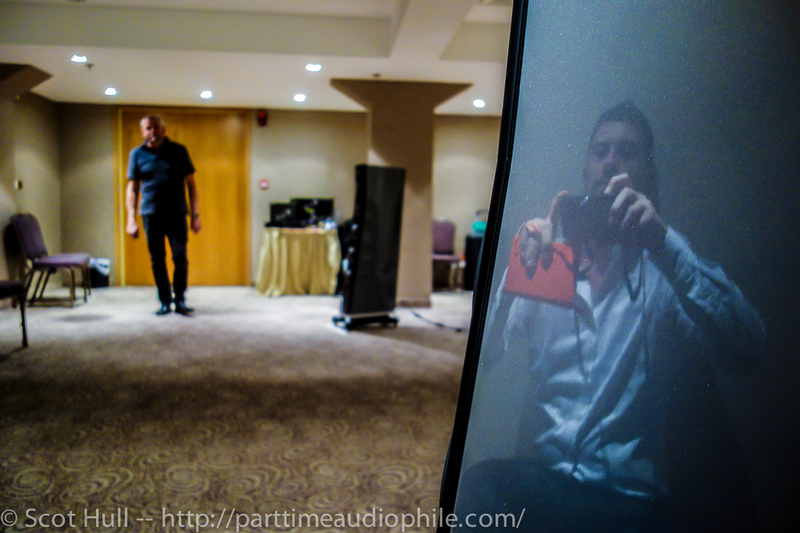 Problem is hotel rooms are made in standard dimensions while true high-end speakers that candidate for best of show are usually larger than what the hotel rooms can handle. Acoustic treatment on such disparities will only get you half way there, one must have the right room right from the start because it is impossible to invent an additional 40-50 cubic meters of air. So here you are, the best sound of the show for the Athens 2014 Sound and Vision show goes to no one, until next year (and if they still allow me in to enter the rooms) have many-many hours of wonderful music.